Thanksgiving is in two days! ** We have visited Plimoth Plantation several times since my in-laws live fairly close, and this book covers a lot of what is talked about when you visit Plimoth. It’s a bit more informative of a book, so I mostly skimmed it with the girls. It’s a really good look at the Pilgrims, the Wampanoag people, and the actual facts of the traditional “First Thanksgiving”. I am glad to be able to talk about these things with my kids. 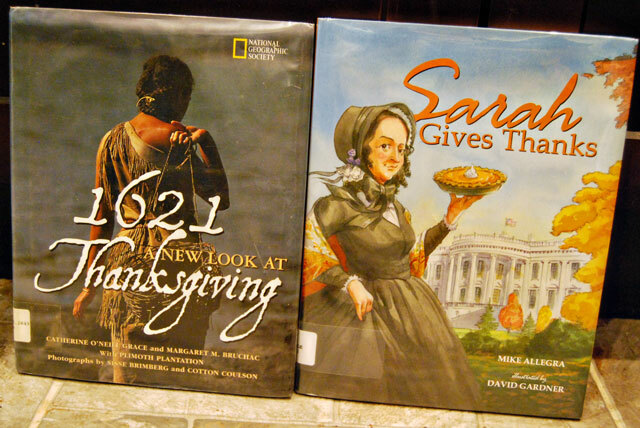 ** A great story that talks about how Thanksgiving became a national holiday, without it being about Pilgrims. I enjoyed this story of a widow who was persistent in her quests for her passions. Also, a good reminder to be thankful for what you have even in times of little. 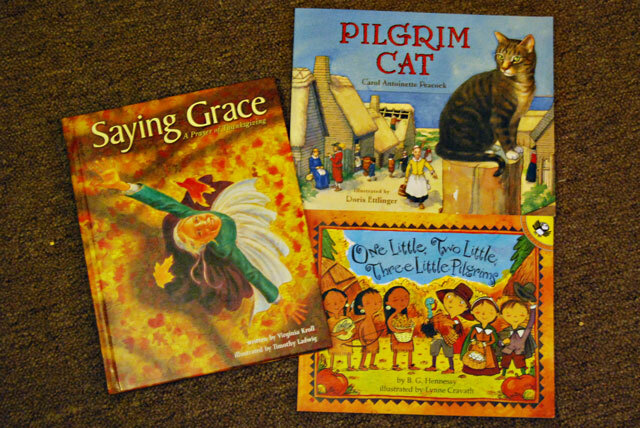 Find special mealtime prayers and Thanksgiving activities inside! Grace’s mind was racing. What was that spelling word that meant ‘great generosity in giving’? She squeezed her eyes shut, and it came to her. Bounty. That was the word! Journey back in time with Grace and relive both the hardships and blessings along with her pioneer family. Saying Grace tells the story of one girl and her discovery of the value of mealtime prayer at her family’s first Thanksgiving. ** Another nice story of one family’s Thanksgiving celebration without it being about the Pilgrims. My favorite part of this book are the beautiful illustrations. This is a Christian book about giving thanks and praying before mealtimes. When young Pilgrim Faith Barrett discovers a stray cat on the Mayflower, she names her new friend Pounce. Together they face the long, cramped voyage and the perils of the first winter at the Plymouth colony. ** I picked this up this past summer when we visited Plimoth because it was about a cat (of course). It’s a cute little story that follows a little girl and her mouser cat on the Mayflower and their first year in the New World and the first Thanksgiving. The activities of ten Pilgrims and ten Wampanoag Indian children as they prepare for a splendid harvest feast at Plimoth (now Plymouth Plantation) are described using the familiar childhood rhyme. ** I was suspicious of this book when I first saw it, but I actually ended up liking it. It’s very simple for the littlest ones in your house, but adorable illustrations and tell a bit of a story of Pilgrim and Wampanoag children getting ready for a Thanksgiving feast.